Before I get into my review there are two things you must know. First, this book doesn't come out until Fall of 2011, so you'll have to wait. Second, everything in this book is absolutely true. I used to work as a Janitor and still remember the daily battles with Toxites. I miss my magic brooms, vacuum, and dust rags. And I'm incredibly jealous that Spencer and Daisy got to use mops. Mops! My boss never let me use the mops. The other day, I had several new books I wanted to read. Sadly, I can only read one at a time, so I decided to skim through the first chapter of each one. I picked up Janitors first and didn't close it until I'd finished the entire book. Janitors is a fun and zany story with a good middle-grade voice and lots of wonder and action. If you are 8-12 years old, or have kids in that age, or (like me) you still act that age you'll enjoy this book. Have you ever fallen asleep during math class? Are you easily distracted while listening to your English teacher? Do you find yourself completely uninterested in geography? Well, it may not be your fault. The janitors at Welcher Elementary know a secret, and it's draining all the smarts out of the kids. Twelve-year-old Spencer Zumbro, with the help of his classmate Daisy "Gullible" Gates, must fight with and against a secret, janitorial society that wields wizard-like powers. Who can Spencer and Daisy trust and how will they protect their school and possibly the world? 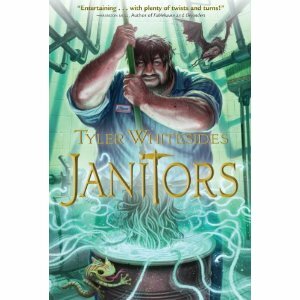 Janitors is book 1 in a new children's fantasy series by debut novelist Tyler Whitesides. You'll never look at a mop the same way again. * This ARC was given to my wife, who is also a book reviewer, so no give-away this time. Sorry. * The copyright to the Janitors book cover is held by the publisher. I hope it's okay that I used it here. If not, I will gladly remove it upon request. I totally need to read this! I saw Tyler Whitesides speak a few months ago and was really impressed. Plus I love a great new MG read. Natalie - I agree. I've met Tyler several times and he is great--so down to earth and sincere. I'm excited for his book to hit the shelves.